From pre-Columbian times through the Inca Empire and down to the modern-day Andean culture, explore this wealth of culture with us on one of our specially-designed treks or cultural experiences. Read more below about the history of the Incas, colonial Peru, the Quechua language, and more! Before the Incas, in the country we know as Peru today, there had developed a wide range of local states that had a high level of cultural, administrative and artistic development, from Chavín to Paracas, Nazca and Mochica, and the Wari, which expanded from the 7th to 10th century almost over all Peruvian territory. There are a number of interesting origin myths about where the Incas came from, but most likely they were a tribe that came from the Lake Titicaca area. This tribe were the Quechua people (Quechua is also the name of their native language) and the head of the tribe was called the Inca. Although “inca” really referred to the leader or king, these days the name Inca refers to this conquering Quechua tribe, generally. After some centuries, this group consolidated their power after defeating neighboring tribes, and around 1438 the Inca state as we came to know it came into power under the Inca Pachacutec. The Inca Pachacutec began the expansion of his dominions by military and diplomatic means through reciprocal agreements with his neighbors or outright conquer. All the achievements of the “Incas” were actually in place prior to the “Inca Empire”, including fine rock construction, cultivation and irrigation systems, but what the Incas did was create, organize, and administer a pan-Andean state that brought together many warring tribes. The success of the reciprocal agreements and administration was based on a common economic system, a system of agricultural production, of redistribution of harvests, and of religion. It was a system that relied on the theocratic hierarchy of the sovereign Inca and his elite in Cusco, and which incorporated the nobility of the conquered states. In many cases, the Inca permitted nobles of other tribes to maintain the administration of their kingdoms. The Inca Empire or Tahuantinsuyo was divided into four parts or suyos (tawa means “four” in Quechua): Chinchaysuyo to the north; Contisuyo to the west; Collasuyo to the south; and Antisuyo to the east. These four regions communicated with Cusco through a vast network of Inca trails. Indeed, the construction of thousands of kilometers of roads was vital to the success of Inca expansion which perfectly maintained communication between the different parts of the state. Also important was the unifying aspect of the cult of the sun, water and earth as central religious themes and the imposition of Quechua (also known as Runasimi) as the official language. Inevitably this vast state over-extended itself and began to decline with a war for the throne between the brothers Huascar and Atahualpa between 1524 and 1532. Both were sons of the Inca Huayna Capac, who died suddenly from smallpox, which had already arrived in South America from Europe with the first conquistadors. The final blow to the Inca Empire was delivered by a small group of Spanish conquistadors led by Francisco Pizarro who tricked and then captured the Inca Atahualpa (the winner of the war between the two Inca brothers) and later executed him. With the execution of Atahualpa in 1533, the Empire effectively collapsed. This was aided by the fact that many factions and tribes of the Inca Empire turned against each other. Current historical thinking indicates that the Spanish would never have been successful without the support of some of these factions. Sadly, some of the Inca nobility who chose to help the Spanish did so believing that once they had regained power, they would throw the Spanish out. Pizarro and the conquistadors took Cusco in November 1533, and the city remained intact for the following three years until the Spanish-imposed Inca, Manco Inca II, amassed a huge revolutionary army of between 100,000 and 200,000 people and laid siege to Cusco for over six months which destroyed much of the Inca capital. Manco Inca retreated to deep into the jungle at Vilcabamba where he continued to fight a guerrilla war, being assassinated in 1545 by members of Diego de Almagro’s faction, to whom he had given refuge in Vitcos. Manco Inca was not able to pass his fighting spirit on to his son Sayri Tapac, who was apparently persuaded by his Cusco family members to side with the Spanish crown. After the death of Sayri Tapac, his brother Titu Kusi Yupanqui assumed leadership. He was baptized as a Christian and generally collaborated with the Spanish, dying of a mysterious illness. Then Tupac Amaru, another brother, young and inexperienced but an implacable enemy of the conquistadors, came to power. The Spaniards, recognizing in his rebellious character the contrast with his brother’s weakness, ordered his capture and pursued him to the last capital of the Incas at Espiritu Pampa. >> Want to go? Experience some of this Peru history first-hand on one of our Vilcabamba treks! Follow the footsteps of the last Incas as you visit places like Choquequirao, Vitcos and Espiritu Pampa. Tupac Amaru was beheaded in the plaza of Lima, in the presence of Viceroy Toledo on September 24, 1572, thus effectively ending the line of the Incas. The Incas had less than one hundred years of glory, yet in this short time this tribe from Cusco conquered a great number of regional states in South America. At its peak, the Inca Empire’s southern border was the Maule River in Chile, and in the north, the Ancasmayo River in Colombia. This Empire or Inca state was called Tahuantinsuyo (also spelled Tawantinsuyu). We know from historical writing and the archaeological record that the Incas did not possess a written language, although they must have used some symbols and perhaps diagrams. >> Read more about the Quechua language below! The qhipu (a collection of colored strings and knots) was extensively used for accounting and record keeping. Qhipus need highly trained interpreters to read them, and the Spanish were unable to locate or interrogate even one of these specialists. Machu Picchu was constructed around 1450, at the height of the Inca empire, and was abandoned less than 100 years later as the empire collapsed under Spanish conquest. Although the citadel is located only about 50 miles from Cusco, the Inca capital, it was never found and destroyed by the Spanish, as were many other Inca sites. Over the centuries, the surrounding jungle grew to enshroud the site, and few knew of its existence. It wasn’t until 1911 that Yale historian and explorer Hiram Bingham brought the “lost” city to the world’s attention. Bingham and others hypothesized that the citadel was the traditional birthplace of the Inca people or the spiritual center of the “virgins of the sun,” while curators of a recent exhibit have speculated that Machu Picchu was a royal retreat. Regardless, the presence of numerous temples and ritual structures proves that Machu Picchu held spiritual significance for the Inca. >> Want to go? 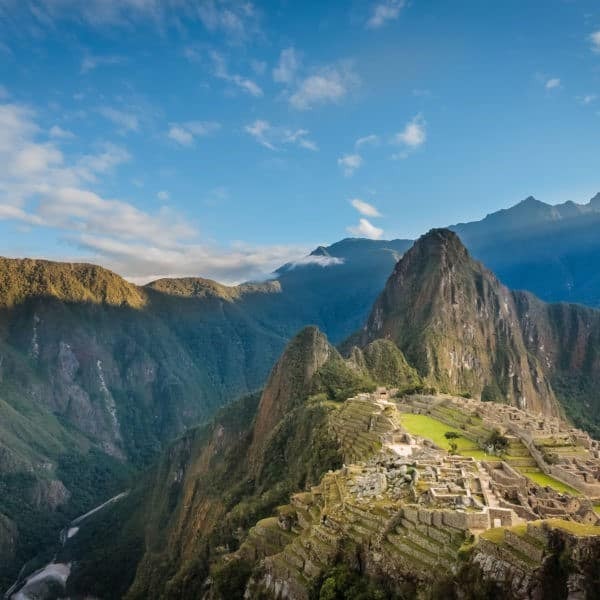 Consult our Visiting Machu Picchu page to make sure you get the most out of your time at this incredible site! You can also check out our Machu Picchu treks and combine a great Andean hike with Peru’s most famous Inca city! For a great overview of Machu Picchu history, see Who Built Machu Picchu? A short history of the Inca, by Gary R. Ziegler. We often believe that before Hiram Bingham came to Machu Picchu, this great citadel and the Inca trail leading to it were unused and unknown. This is not exactly true. There were a number of settlers in the Maranpampa area growing sugar cane a hundred years before Bingham’s “discovery”. Peter Frost comments, “A church document of 1728 states ‘over 900 souls inhabit the stretch of river between here and Guaynapicho’ who lack any form of spiritual administration.” “Guaynapicho” probably refers to what we now call Huayna Picchu. In addition, 30 years prior to Hiram Bingham’s explorations, the explorer Antonio Raimondi clearly marked on a map “Cerro Machu Picchu”. In the last century of colonial rule and during independence, the area downriver from Machu Picchu became a centre of sugar and coca plantations, which produced much cane alcohol. Moonshiners evaded taxes along the official route by carrying on muleback the alcohol up the Aobamba valley, joining the Inca trail between the first and second passes. It is imagined that the mules badly damaged the Inca trail which is why there is no Inca paving up to the Pacaymayo campsite, and the good state of preservation after this point. Huayna Picchu means “young peak” – in contrast to Machu Picchu’s “old peak” – and is the mountain that is located to the north of the Inca city. The mountain, looming behind the lost city, is an important part of the icon that we know as Machu Picchu as it forms the backdrop of most iconic Machu Picchu photos. Its highest point is 2700 m and allows us splendid views of Machu Picchu and the nearby mountains. Huayna Picchu was used by the Incas to build a number of complexes, like the impressive Temple of the Moon, which is found at the back part of the mountain. The Incas also made a series of small agricultural terraces at the peak and some buildings. These buildings could have formed part of an astronomical observatory but also might have served as a lookout point over the city because from this point you can literally see all across Machu Picchu, Inti Punku and the paths that lead to the city. Though the climb is a little dangerous and quite steep, it is possible to climb up to the Huayna Picchu ruins in less than an hour. It offers some wonderful views, and you will be amazed at the determination and engineering skills of the Incas when you see the slopes that they had to overcome to complete this construction! This hike is a must-do for anyone in even moderately good shape. Note that an additional permit must be purchased in advance in order to climb Huayna Picchu, separate from the Machu Picchu entry fee. >> Read more about climbing Huayna Picchu on our Visiting Machu Picchu page! This archaeological site possesses one of the most beautiful Inca constructions inside of a cavern, to which finely polished rocks were added, fitting perfectly into one another, without even one millimetre of space between their joins. The Temple of the Moon’s structure has beautiful vaulted niches and empty trapezoidals of typical Inca type and in front of the cavern, there is a rock sculpted in the shape of an altar, which makes us suppose that this was a place for sacrifices or other offerings. 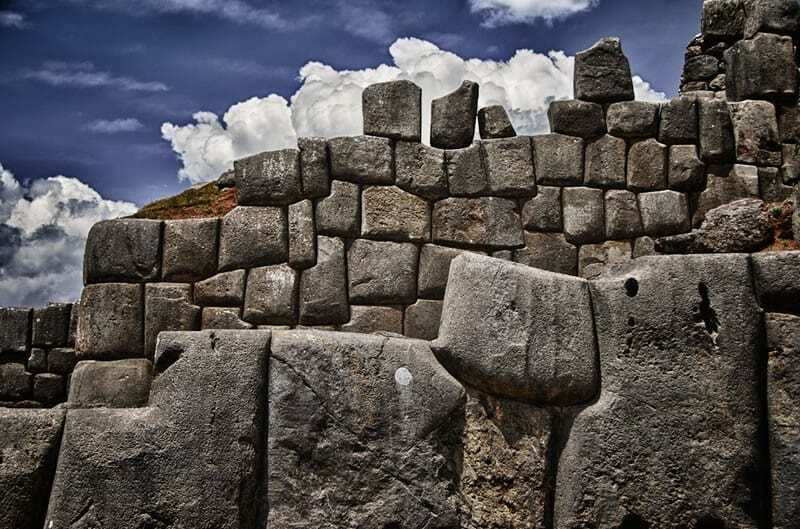 Cusco is surrounded by some superb archaeological sites, full of Peru history and technological marvels. Read about these sites below, or join us on one of our Four Ruins excursions to see these larger-than-life sites in person! Inca cosmological belief held large rocky outcrops in reverence, as if they possessed some hidden spiritual force. Q’enko is one of the finest examples of an artfully carved rock and an excellent illustration of how the Incas worshipped. This large limestone rock shows complex patterns of steps, seats, geometric shapes and a puma design. The name of this small but fascinating ruin means ‘zigzag’ because it is covered with zigzagging channels. These channels were used for the ritual sacrifice of chicha (traditional corn beer) or llama blood. Inside the rock are large niches and a possible altar. This may have been a place where the mummies of lesser royalty were kept along with gold and other precious objects. Situated on a hill with a superb view over the surrounding countryside, Puca Pucara (which means “red fort”) was more likely a tambo, a resting place, rather than an actual fortress. Travelers may have lodged here with their goods and animals before entering, or after leaving, Cusco. An alternative theory is that it served as a guard post that controlled the flow of people between Cusco and the Sacred Valley. This small ruin consists of a beautifully constructed ceremonial stone bath and is therefore often called “el baño del Inca,” the Inca’s bath. It was a site for ritual bathing. The excellent quality of stonework at Tambomachay suggests that its use was restricted to the aristocracy, who maybe only used the baths on ceremonial occasions. The ruins basically consist of three tiered platforms. The top platform has four niches that probably were used as seats. On the next level an underground spring emerges directly from a hole to the base of the stonework. From here it cascades down to the bottom platform, creating a cold shower that was just high enough for an Inca to stand under. Visitors to this magnificent Inca Fortress cannot fail to be impressed by the beauty and monumental scale of this important construction. Sacsayhuaman is variously translated as “speckled falcon” or “speckled head”. The last interpretation refers to the belief that the city of Cusco was set out in the form of a puma whose head was the hill of Sacsayhuaman; the Plaza de Armas was at the heart of the puma. The main ramparts consist of three massive parallel walls zigzagging together for some 400m, designed to make any attacker expose his flanks. The massive blocks, the largest being 8.5m high and weighing nearly 300 tons, are fitted together with absolute perfection. The foundations are made of Yucay limestone brought from over 15km away. The outer walls are made from massive diorite blocks from nearby, and the inner buildings and towers are made from dark andesite, some of it brought from over 35km away. With only natural fiber ropes, stone hammers and bronze chisels available, the construction must have been an enormous task. The chronicler Cieza de Leon, writing in the 1550s, wrote that some 20,000 men were involved in the construction of Sacsayhuaman: 4,000 men cutting blocks from the quarries; 6,000 dragging them on rollers to the site; and another 10,000 working on finishing and fitting them into position. According to the legend, some 3,000 lives were lost when a huge stone that was being dragged uphill broke free. >> Want to go? Visit these fascinating sites on our Four Ruins excursion! 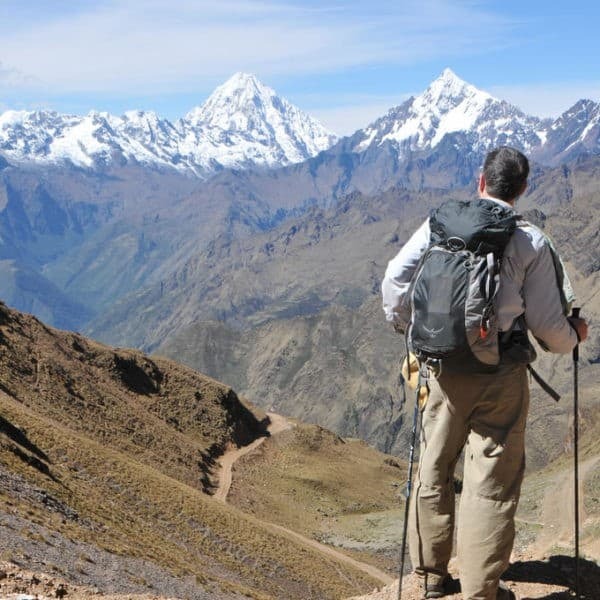 The Classic Inca Trail is famous around the world, but few realize that this is just one small part of a vast network of Inca trails that held this great empire together. The Inca Trail to Machu Picchu is part of an extensive Inca system of trails of more than 23,000 km that integrated the Inca Empire, or Tahuantinsuyo. This Inca road network covered Colombia, western Brazil, Ecuador, Peru, Bolivia, northern Chile and Argentina. These trails tended to be principally on the coast or in the mountains but in a few cases they reached the tropical edge of the jungle. These Inca trails – the Qhapaq Ñan, or “royal path” – were without a doubt one of the marvels of the Tahuantinsuyo, and Peru history in general, according to the Peruvian historian, José Antonio del Busto. Busto explains that the Inca Huayna Capac is responsible for the greatest expansion of this network of trails in order to quickly mobilize his army. > The trails varied in quality and size. They could be 6 to 8 meters wide on the coast but in the mountains the paving was only one meter wide; however, the path was audaciously steep and climbed over the imposing Andean mountains. There are a number of ancient paths close to Cusco – for example, at Qhorqa, some 20 km from Cusco, and on the route to Huchuy Qosqo. These were constructed perfectly and are still used without much modification. We are used to a road system designed for the horse and then for the car: a system which tries at all cost to avoid steep gradients and whose ideal (so established by the Romans) is the straight road over flat ground. The Inca needs were very different: the expansion of their Empire was driven by the llama, which as a pack animal could carry their merchandise over long distances … Along the route, Inca tambos, the resting houses used by such merchants, as well as by chasquis, the Inca messengers, and by the Inca armies, would have plentiful supplies of p’olqo, the cloth used for protecting llamas’ delicate feet on the stone paths. The llama was an all-purpose provider. As well as being a pack animal (although it would never accept a rider), the meat could also be eaten, the dried dung used for fuel, essential in some areas of the high puna above the tree-line, and the coarse wool woven into textiles. However, llamas have very specific needs: they are happiest at high altitudes (over 13,000 feet) and while they can descend for short periods, any road carrying them must deviate frequently to higher ground in order to give them pasturage – a point the conquistadors complained bitterly about as they kept ascending endless mountain passes on their way from the coast to conquer Cuzco. Camelids are far more accomplished climbers than the horse and so can negotiate stairways. The Incas could therefore avoid the lengthy ‘zig-zag’ technique by which European roads climbed a mountain slope and instead simply use steep stairs to gain height, so reducing road-building to a quarter of the European length. One of the tragedies of the Conquest is that the Incas failed to realise early enough the advantage this potentially gave them over the conquistadors and their horses. Each time the Spanish dismounted in order to negotiate the difficult mountain roads they could have been slaughtered. It is also interesting to note that the Inca were a totally regimented society. Although great numbers of people were moved around for state projects (mit’a) and resettlement, once at a location, they did not move. The royal roads were reserved for official travel. A message sent by relay runner (Chasqui) from Quito could reach Cusco over a route of 1230 miles in five days. From Cusco, the same message could be sent to the far end of Lake Titicaca in three days. And in his palace in Cusco, the Inca dined off fresh fish delivered from the Coast, a distance of 200 miles over the highest Andes, in two days. 1230 miles in five days! That would mean that the chasqui relay was run at an average of 246 miles a day! The Romans were fortunate indeed if their mounted couriers could cover 100 miles a day. Von Hagen and his team discovered an extra wide highway between Jauja and Bonbon and a series of well-preserved chasqui stations (okla) that enabled them to carry out a series of investigations with local runners. They proved that by using a system of trained runners it was possible to cover the distance between Cusco and Quito in five days. The Inca trail to Machu Picchu still existed and was re-discovered by Hiram Bingham when he realized his clearing work between 1913 and 1915. The Inca trail that we commonly think of was a route of pilgrimage to Machu Picchu used by the Inca in the 15th century. There are different sites between Ollantaytambo and Machu Picchu where one can note the variety in architectural resources that give rationality, importance and mysticism to the Royal Road. It did not have a commercial use; there were other, simpler trails to transport products, llamas and people to Machu Picchu. The purpose of the Inca trail to Machu Picchu was religious and ceremonial, a pilgrimage that included rituals to honor the mountains, the Apus, along the route, like Veronica or Wakaywillka. The Cathedral is located on the northeast side of the Plaza de Armas, and is an important part of Peru history. Construction commenced in 1559 and it took almost a hundred years to complete the work. It is built on the foundations of the Inca Viracocha’s Palace (Viracocha, also spelled Wiracocha, was the father of Pachacutec) in the shape of a Latin cross. The Cathedral contains one of the city’s greatest collections of colonial art with nearly 400 colonial paintings including “The Last Supper” by Marcos Zapata which depicts Christ and the Apostles having a guinea pig for supper and a glass of chicha! Ten smaller chapels surround the nave. The Chapel of El Señor de los Temblores (The Lord of the Earthquakes) and the Chapel of the Immaculate Conception are worth a look. The Santo Domingo Church was built in the 17th century on the foundations of the Inca Temple of the Sun, Q’oricancha (also spelled Koricancha). The Church was nearly destroyed by earthquakes twice, but due to the spectacular construction of the Inca walls it sustained minimal damage. The uninspiring Baroque decoration of Santo Domingo contrasts poorly to the superbly crafted Inca masonry, and much of the cloister has been gutted to reveal four of the original chambers of the great Inca Temple. Some of the finest Inca stonework that one can see in all of the old Inca Empire is the curved wall beneath the west end of the Church. It is said that during Inca times the walls of Q’oricancha (Quechua for “golden courtyard”) were lined with about 700 solid-gold sheets each weighing about two kilos. This is where life-sized gold and silver replicas of corn were ceremonially planted in agricultural rituals. Also reported were solid-gold treasures such as altars, llamas and babies. All that remains today of this splendor is the stonework – the conquistadors took the rest, which was melted down, and nothing survives. >> Want to go? You can visit the Cathedral and Q’oricancha on our Half Day City Tour! The entire temple complex was also an observatory, from which priests monitored major celestial activities. Every summer solstice, the sunrays shine directly into a niche – the tabernacle – in which only the Inca was permitted to sit. Along with the main temple dedicated to the Sun, there were other temples dedicated to the Moon, Venus, Thunder and Lightning and the Rainbow. Nowadays, tourists most frequently encounter the chakana (or chacana) on jewelry sold around Cusco, but the symbol is rich with meaning and lies at the heart of the Inca Empire. The classic chakana symbol cleverly incorporates a vast amount of Incan law, culture and belief, represented by repeating elements in 2s, 3s and 4s. First of all, the figure can be divided in half horizontally, with the top half representing hanan (the upper world) and the bottom half hurin (the lower world). Divided in four, the four quadrants represent Tahuantinsuyo: Chinchaysuyo, Antisuyo, Collasuyo, and Contisuyo, each of which themselves represent a cardinal direction. And Cusco is represented in the center, the “navel of the world”. Others have found other meanings in the chakana symbol, from the twelve months of the year to meteorological phenomena. A lot of the Apus Peru team speaks Quechua, the indigenous language here in the Andes, and one of the most thriving indigenous languages in the world. It’s a beautiful language, with really interesting grammar and phonetics, and, we’re told, it lends itself especially well to humor and double entendres! One of the interesting things about the Quechua language is that it was historically an oral language; it was not written down! That’s one of the reasons the Andean textile tradition is so important. Nowadays, there is a written Quechua language but because of its oral history, and despite efforts to establish an “official” version, there are multiple accepted spellings of words. There are a few schools in Cusco where you can take Quechua classes, but in the meantime, here are a few simple phrases and words to get you started. · Apu – the best place to start since it’s in our name, “apu” is usually translated as “mountain deity” or “mountain god”. It is important to note, though, that the belief is not that gods inhabit the mountains, but that they are themselves gods or deities. · Imaynalla kashanki – a fairly formal greeting which asks “how are you?”. The appropriate answer is allinmi kashani. · Allillanchu – a more common, less formal greeting. · Sulpayki – thank you. You can also say urpillay. · hayka – how much?